Smartphones and social networking sites are likely to become the next big target for cyber criminals, according to a security industry report. Symantec's annual threat analysis warns that the technologies are increasingly being used to spread malicious code. 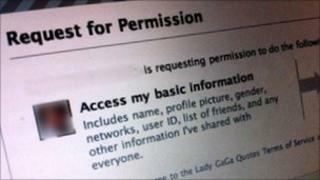 Users of Facebook, Twitter and Google's mobile operating system, Android, are said to be particularly vulnerable. However, the number of attacks remains small compared to other online crimes such as e-mail phishing. According to Symantec, known vulnerabilities in mobile operating systems rose from 115 in 2009 to 163 in 2010. In several cases, the security holes were exploited and used to install harmful software on Android handsets - suggesting that criminals now view smartphone hacking as a potentially lucrative area . At least six different varieties of malware were discovered hidden in applications that were distributed through a Chinese download service. "It is something we have started to see happen, albeit on a small level," said Orla Cox, security operations manager at Symantec. "It allows people to do a variety of things from intercepting SMS messages to dialling toll numbers. They have opened up the possibility of what is there." Several pieces of malware were also found on iPhones, however only devices that had been "jailbroken" to bypass Apple's security were affected. The company's process of pre-vetting all new applications is believed to have spared its devices from a major attack. 286 million - number of unique variants of malware detected. 1 million - number of zombie computers controlled by Rustock botnet. 260,000 - average number of personal identities exposed in each corporate attack. 6,253 - number of new software vulnerabilities that could be used by criminals. 42% - increase in the number of vulnerabilities on smartphones. 14 - number of never-before-seen 'zero day' vulnerabilities that first turn up in malware. On Facebook and Twitter, Symantec's analysis highlighted several different types of threat. Among the most prevalent were web links that encourage users to click through to other sites containing malware and rogue applications, designed to collect personal information. The company estimates that one in six links posted on Facebook pages are connected to malicious software. User information is said to be particularly valuable in "social engineering" attacks, where criminals use knowledge of an individual to trick them into scams that appear to relate to them personally. The report also raises concerns about shortened URLs, such as http://tiny.cc/jumqm. Such systems are widely used to shorten web addresses, but they also make it harder to tell what the target site is. Sixty-five per cent of malware links on social networking websites were found to use shortened URLs. Its annual Internet Security Threat Report - based on data supplied by users around the world - is generally regarded as a reliable measure of changing trends in cyber crime. Globally, the company recorded a 93% increase in the volume of web-based attacks between 2009 and 2010. The dramatic rise was largely attributed to the widespread availability of "attack toolkits" - software packages that allow users with relatively little skill to design their own malicious software. Toolkits are available to buy online for as little as a few pounds and as much as several thousand for the latest versions. The most popular attack kit was Phoenix, which exploits vulnerabilities in the Java programming language - commonly used for web-based applications. Symantec's report also notes a rise in the number of targeted attacks, where specific companies, organisations or individuals are singled out. The most sensational targeted attack of 2010 was undoubtedly Stuxnet. The software worm was designed to take control of mechanical systems used in Iran's nuclear plants. It has been widely speculated that the USA or Israel may have played a role in its creation. Despite Stuxnet's headline-grabbing nature, Orla Cox believes that it may not be indicative of things to come. "It was interesting to see that it is possible to attack physical systems. I think it unlikely that we will see a whole slew of attacks of that nature," she said.